The Brittany Spaniel is a very athletic, compact, and solidly built hunting dog. Brittany's were developed in the Brittany province of France between the 17th and 19th centuries, becoming officially recognized early in the 20th century. They should range from 17-20 inches in height at the shoulder, and weigh between 36-45 lbs. 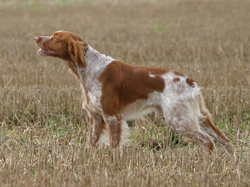 Brittany Spaniels are very active dogs and can cover a lot of ground while hunting. A Brittany Spaniel will have slightly longer hair that will need minimal grooming. Brittany's are versatile in that they will hunt waterfowl as well as being a very solid upland gun dog with a natural retrieve. They bond well with their family and are a loyal companion. 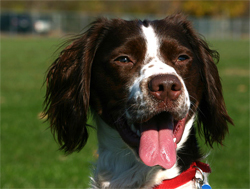 Additional breed information for the Brittany Spaniel can be found at the American Kennel Club website.